Get additional discounts for frequent travelers/ for referrals. Coupons for availing best offers during special occasions (Insurance for unlimited passengers, etc). 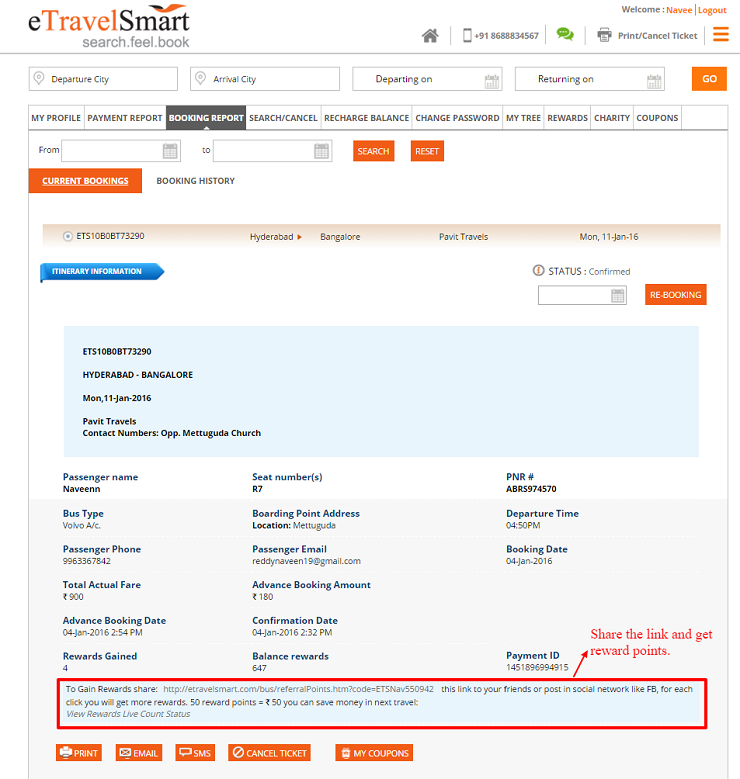 eTravelSmart Solution Happy to share that all customers are eligible for Reward Points on their bookings @ eTravelSmart. The more you travel with us the more you will be eligible for reward points which can be redeemed during your next travel. Additional reward points for referring your dear & near ones. Also Coupons are made available during special occasions for getting additional benefits. Your account enables you to get live status of your reward points any time. How does it work? For each Rs 200/- (Two Hundred only) spent by you, you will get 1 reward point which is equal to Rs 1/- (One Rupee only). T&C: Reward points will be reversed in case of Ticket cancellations by you/ service cancellations by the operators. Note 1. You will be able to redeem reward points once you have minimum of 50 points and multiples of there of. 2. Reward points get expired by 31st March every year, if not redeemed. 1. Access eTravelSmart's Loyalty Reward Points from "My Profile" Section. Earn more reward points by booking bus tickets every time and redeem them in to instant cash discount for your next bus ticket booking. 2. Earn more reward points by referring your unique "Referral URL" to your friends among various social networks. Get Unique Referral URL from My profile section and Ticket Confirmation page.